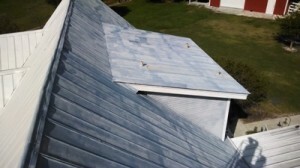 Peerless Pressure Washing Inc. provides metal roof painting. 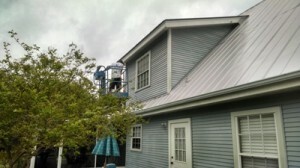 In these painting pictures you can see the project from start to finish. This first picture displays half of the roof after cleaning without prime coat. The other side you can see where our professional painters have applied Pro Cryl Industrial Primer by Sherwin Williams. This is the best primer for this application. The primer will prevent rust from forming under the top coat. In addition to preventing rust, the primer will provide better adhesion or grip for the top coat. Always make sure before any painting project, proper prep work is completed. The roof must be free of all molds and debris. Peerless Pressure Washing Inc. has been cleaning roofs for over ten years servicing thousands of homes and commercial building throughout the metro areas. 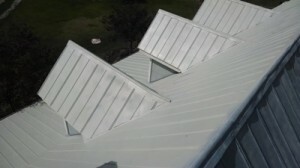 The Peerless Process for roof painting is a two-step system. First a chemical application is sprayed to the surface to kill algae and molds. This solution may or may not be rinsed for 24 hours depending upon the severity of algae present. Once a 100% spore kill rate is achieved, we turn our professional grade pressure washing system to the roof. The surface must now be rinsed and in some cases high pressure washed to remove debris and oxidation. After the surface has been cleaned and primed, only then will we proceed with applying the topcoat. This project received a Sher-Cryl High Performance Acrylic from Sherwin Williams. This coating is designed to be used with metal surfaces. The top-coat is applied with a airless sprayer and in some areas must be back-rolled to avoid lap marking.